The tight cluster of canvas tents filled a dusty field just off the highway that cuts through the city of Nowshera, the largest city in Pakistan’s Khyber-Pakhtunkhwa province, about a 90-minute drive from the capital Islamabad. Doctors in white coats tested children’s temperatures and blood pressures, looking for the signs of water-borne diseases, from acute diarrhea to potentially deadly cholera. Their mothers sat nearby, batting away the flies. Volunteers doled out food and water. The camp was indistinguishable from several now operating across Pakistan, except for its sponsor: this one is run and funded by the charity arm of Lashkar-e-Taiba, the terrorist group behind the 2008 Mumbai attacks, which killed 166 people. Today, Pakistani officials repeatedly insist that aid will not fall into the hands of extremist groups and that those groups won’t be allowed to take advantage of the crisis to increase their support. But this camp and others now operating in the flood-zone raise serious doubts about that argument. The camp director told us he's operating with no restrictions. "We've been here since soon after the floods," he said, "and we have 17 camps all over the district." Starving and homeless, the victims weren't asking any questions. "What can I do? When your children are hungry, you'll accept help from anyone," one man told us. 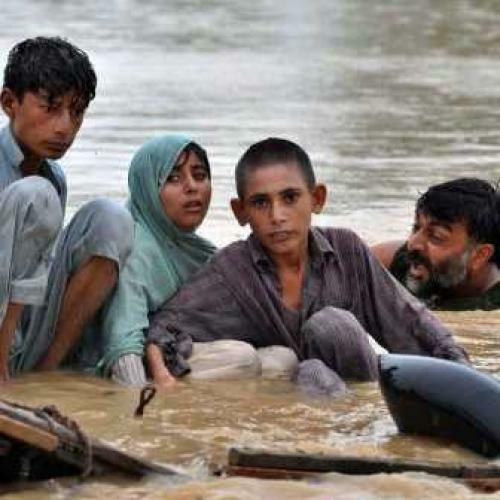 There have been several measures of the Pakistani government's failure to respond effectively to the country’s worst-ever natural disaster: eight million of 20 million people still in need of food, water, and shelter; a president seemingly more interested in his son's budding political career in Britain than the flooding. But the rapid response of extremist groups could be one of the most worrisome. The crisis has given them an opening–-and they seem to be marching right through it. The crisis is of grave concern to U.S. officials. America is mounting a relief effort far bigger and more generous than any other country: $160 million dollars, 18 Marine helicopters, much needed to deliver aid to the hard-hit Swat province. The response is driven both by the human need and the very real security concerns. As he visited Pakistan this week, I said to Senator John Kerry that had I met him a month ago, I would have asked him if Pakistan was up to fighting the insurgency—before the floods exposed the country's crippled ability to meet its citizens' basic needs. The frustration of average Pakistanis with their government is palpable. As I drove back to Islamabad from the flood-zone earlier this week, hundreds of protesters blocked the main highway, dumping piles of rocks on the pavement to make it unsafe to drive. As the sun went down and most Pakistanis retreated to Iftar, the roads opened but the debris remained. Driving the highway became a dangerous slalom. We told police at a checkpoint, but they seemed in no hurry to clean things up. More broadly, there is a direct connection between deprivation and the militancy. Throughout Pakistan, the districts facing the worst food shortages are the very same areas where the militancy is most active—and those districts are concentrated right along the border with Afghanistan. Those mischievous Taliban are already stepping in. Something similar happened after the 2005 earthquake, which killed 70,000 people. But this time around, in addition to launching an ambitious relief effort, the U.S. is already committed to a much larger, more comprehensive development plan under the Kerry-Luger Act: $7.5 billion over five years. Secretary Hillary Clinton announced at the UN last week that some of those funds will now be diverted to immediate flood recovery. While the U.S. is clearly aware work needs to be done—and quickly—many Pakistanis are waiting for evidence that their government realizes the same. Jim Sciutto is a senior foreign correspondent for ABC News.